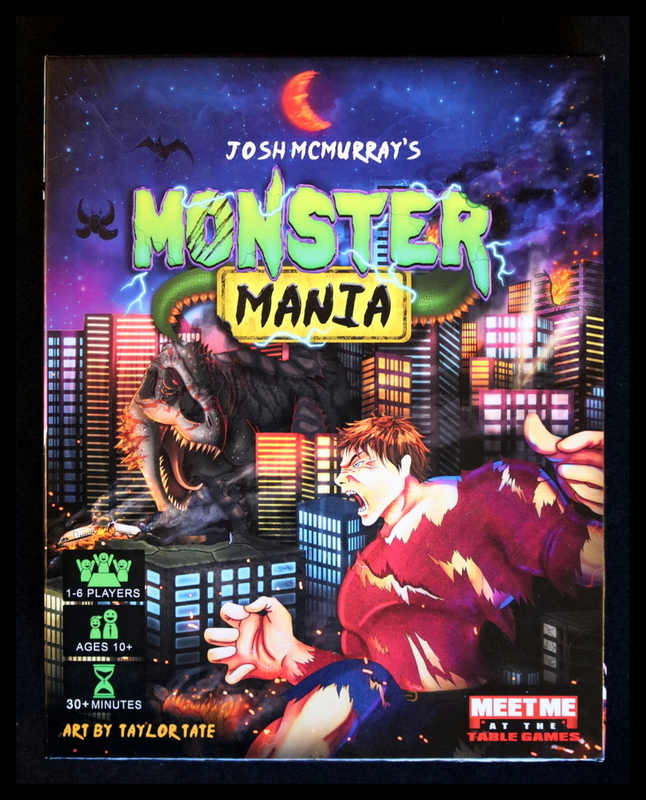 Monster Mania is a heavily strategic game for 1-6 players (solo and co-op mode are variants) where you play the role of a bevy of massive monsters including huge insects, robots, dinosaurs, and more! These monsters are all bent on destroying each other and everything around them, all while using the city as their battleground! Use an expansive environment including oil trucks, cruise liners, and ferris wheels to throw at your opposing monsters; the world is your arsenal! Play counters from your hand to sway the tide of battle in your favor! Activate supports such as military tanks, trees, and power plants to assist your monsters! Topple buildings, evade damage, and launch devastating attacks as you defeat all other monsters standing in your way! 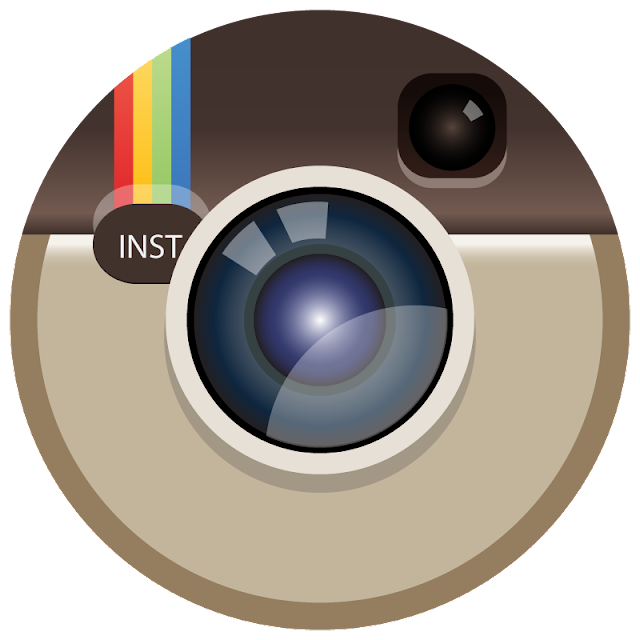 WARNING: This is a preview of Monster Mania. All components and rules are prototype and subject to change. Monster Mania is expected to launch on Kickstarter on December 1, 2018. 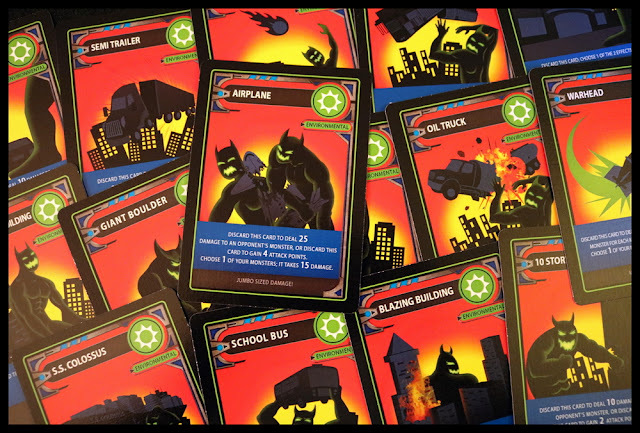 Monster Mania is a card-based battling game for 1-6 players who build up teams of giant monsters (Tyrantyla, Behemoth, Iron Menace, TerrorSaur) and use these monsters along with helper cards to defeat their opponents. 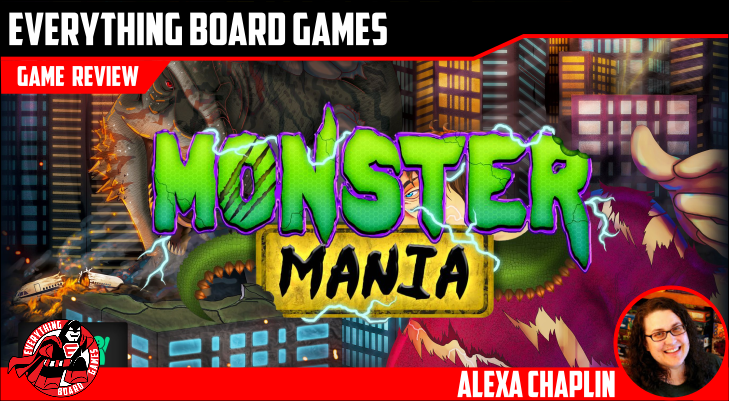 Each monster you defeat earns you a Prize Point, and the first player to 5 Prize Points wins! 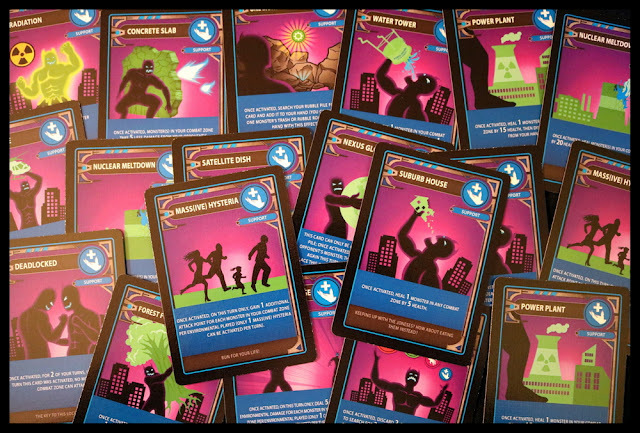 The card art in Monster Mania oozes creativity and indulges your sci fi/fantasy/horror urges by giving you a host of terrifying monsters and effective support cards to bring the monster battle to life. Monster Mania is a card game, and includes a massive deck of 210 cards of various types (Monsters, Support, Counter, and Environmental). The game also includes a large rule book, 6 playmats, 6 instruction cards, and a variety of tokens (attack, damage, turn, and prize tokens). My components are from a prototype version printed through Game Crafter, so be aware that they are not necessarily the final versions. 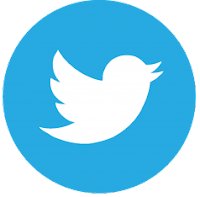 Learning the game and setting it up takes a while as you're getting to know the game. We found the rulebook--although large and colorful--a little hard to follow for first-time players. 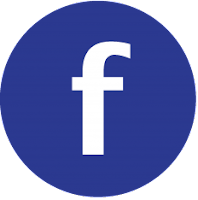 FAQs are mixed in with the general rules and some of the most helpful information is left out or better summarized on the instruction cards. You'll need to start by removing one of each Monster from the deck--but they're not listed in the rules, so you'll have to comb through the deck yourself until you are sure you have one of each. Each player gets one starting Monster at random and places it in the Combat area of their playmat. 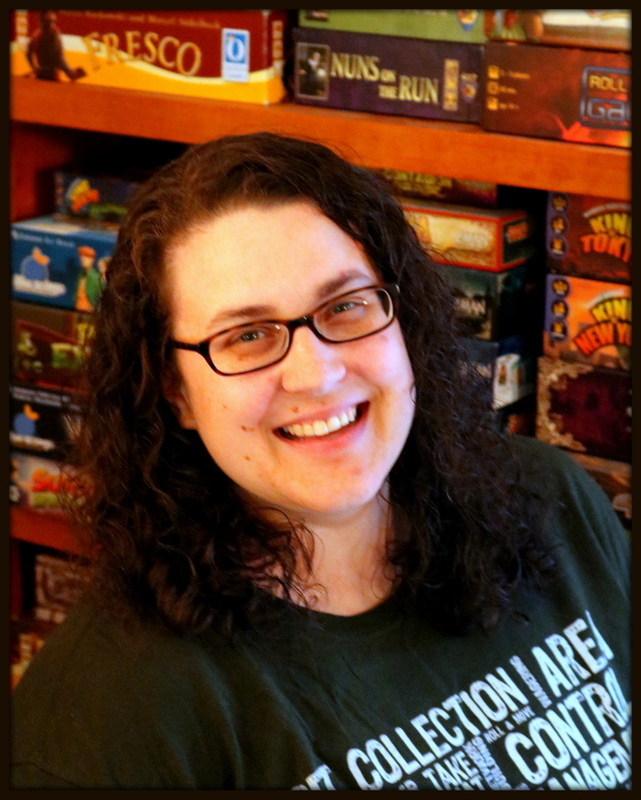 The rest of the Monsters get shuffled back into the enormous deck and you're ready to play. 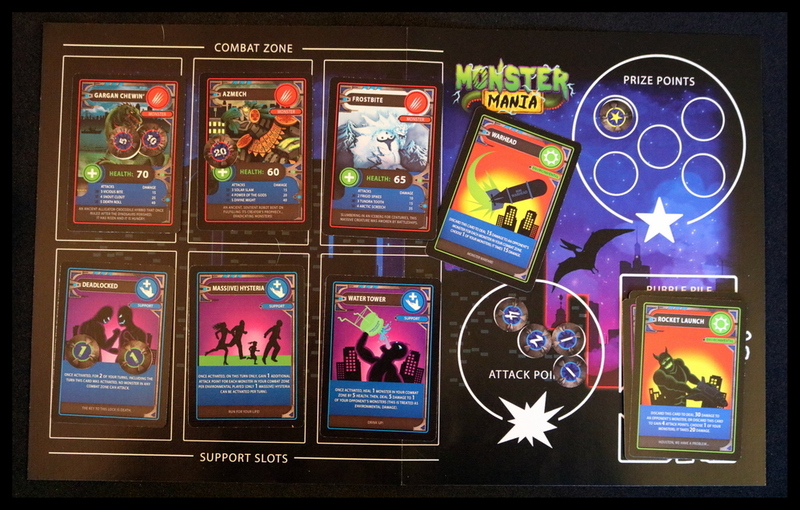 Monster Mania plays in a way that's largely familiar to fans of other battling card games. You'll draw a hand of cards (here, draw five cards from the giant communal deck) and use these cards to build the force in front of you by laying down Monster Cards (up to three in the Combat section of your playmat) and Support Cards (to be used now or later), playing Environmental Cards to take actions that can earn you Attack Points, and holding or playing Counter Cards to undo things your opponents have done. 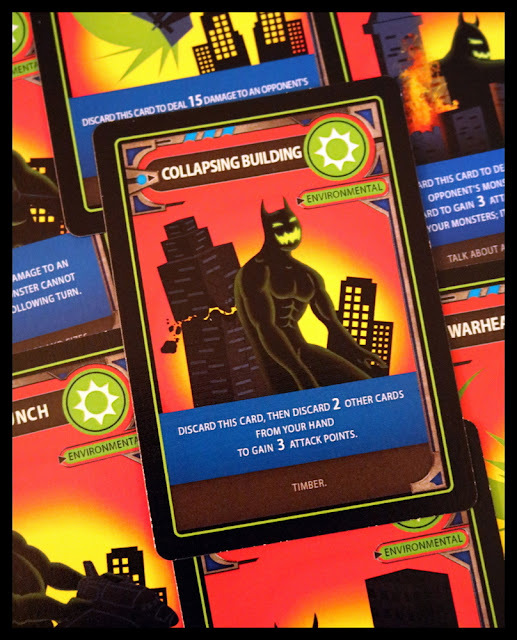 You want to accumulate Attack Points by playing your green Environmental Cards--for example, play Collapsing Building: Discard this card, then discard 2 other cards from your hand to gain 3 Attack Points. Once you have gained as many Attack Points as possible from the cards in your hand, you can use them to attack other Monsters in play. Each Monster has a few specific attacks that have different Attack costs. 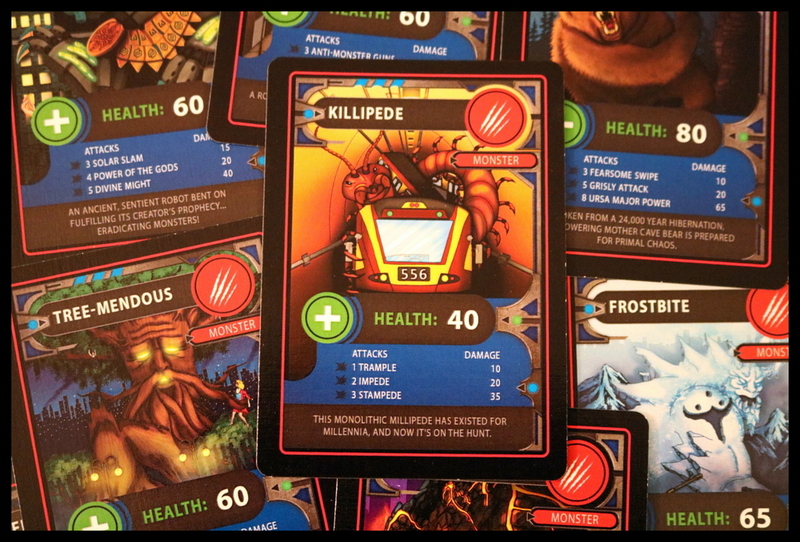 For example, the Killipede can Trample at a cost of 1 Attack Point to deal 10 Damage, Impede at a cost of 2 Attack Points to deal 20 Damage, or Stampede at a cost of 3 Attack Points to deal 35 Damage. Each Monster has its own creatively named attacks, a little bit of flavor text, and its own Health points listed. 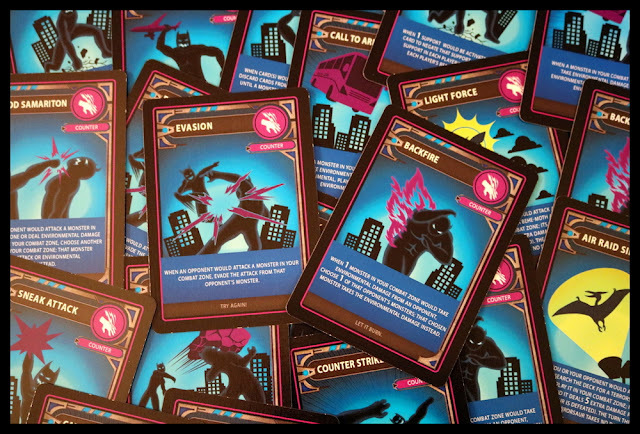 Your opponent has the chance to use Counter Cards, like Counter Strike: When an opponent would attack a Monster in your Combat Zone, evade the attack from that opponent's Monster, then gain 1 Attack Point. Damage dealt gets added to the Monsters (use Damage Tokens to show how much), and you can attack as often as you have Attack Points to spend. At the end of your turn, you may discard any cards you don't think you'll use, so that you will have more fresh draws at the beginning of your next turn. 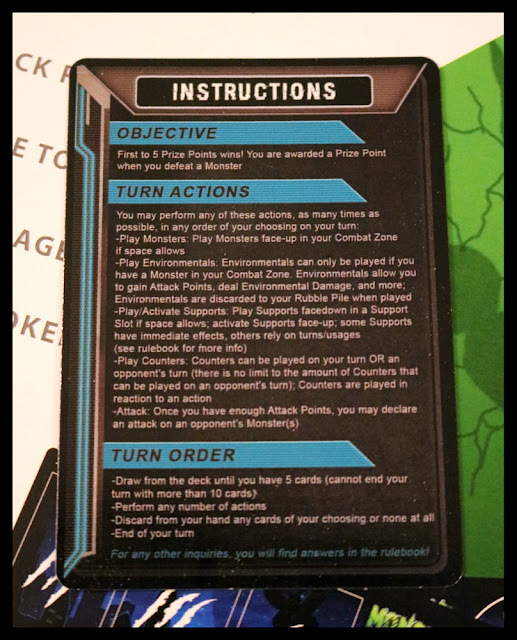 Monster Mania has a bit of a learning curve--not only is the rule book better laid out for more experienced players who are already familiar with the cards, but the prototype version of the player aid cards use the smallest font I have seen used this way and are very difficult to read and use. However, the Monsters themselves, as well as the different actions available, really drew us in to the story that the game was telling. 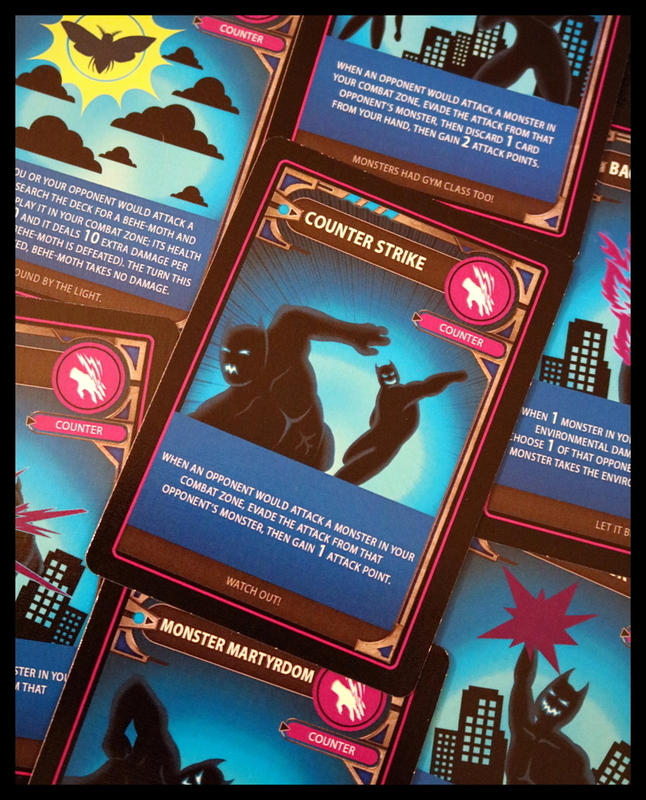 The player-on-player fighting style with Counter Cards in play is very interactive and leads to a lot of tabletalk and entertaining banter, and the illustrations are fun and unusual. 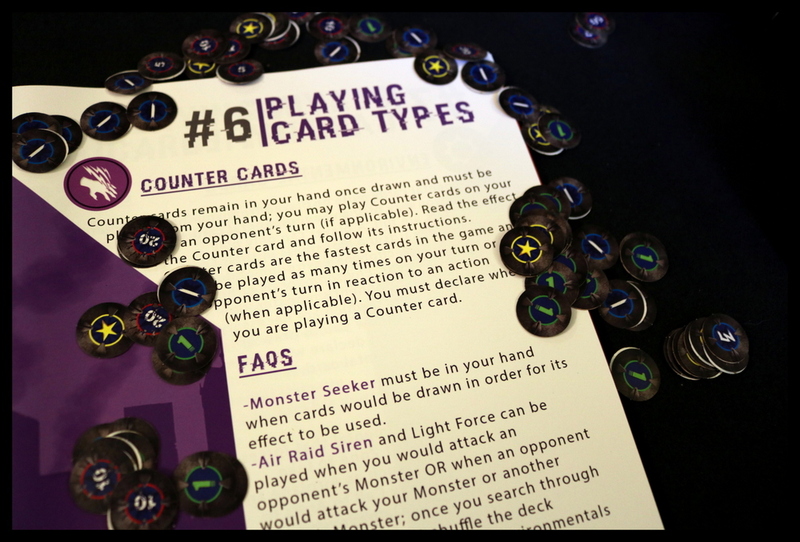 The rules also include variants for solo play (fight certain line-ups of Monsters with rules for the Monsters to each draw and play one card per turn) and co-op mode, which is actually a team variant for 2-on-2 or 3-on-3 play. The back of the rule book even includes a serious of Monstrous Challenges--things you can check off when you do, like winning a Shutout or earning Heavy Hitter by dealing 110 Damage in one Attack. Monster Mania has a really entertaining theme for fans of sci-fi, fantasy, and monster/horror movies. We were lucky to be playing it in October, which fit right in to our Halloween games. The art on the Monsters is really colorful and creative, and we enjoyed the art on the other cards which uses an all-black monster as a sort of generic, all-purpose baddie. The fluff text and various card effects are compelling, too. 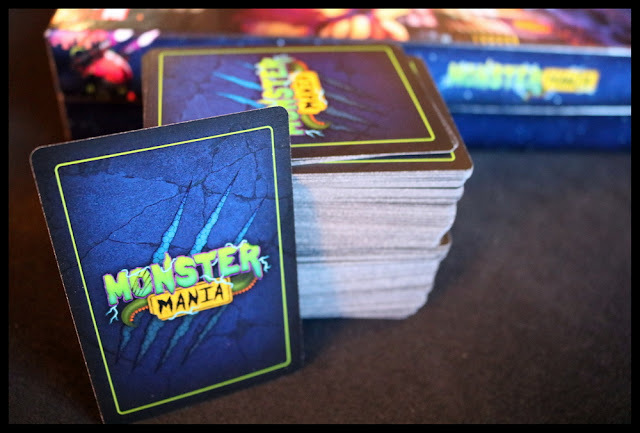 Once you've found your footing, Monster Mania provides a solid battling format with tokens to keep track of what you're doing and the playmats to help stake out your area. The Monsters themselves are amusing and distinct and help the theme shine through. I also really like to see a rule book that already takes into consideration various configurations--a solo mode is included, as well as team-play modes. The Monstrous Challenges at the back are fun too, and provide a different way of thinking about the game as you get farther into your journey with it. 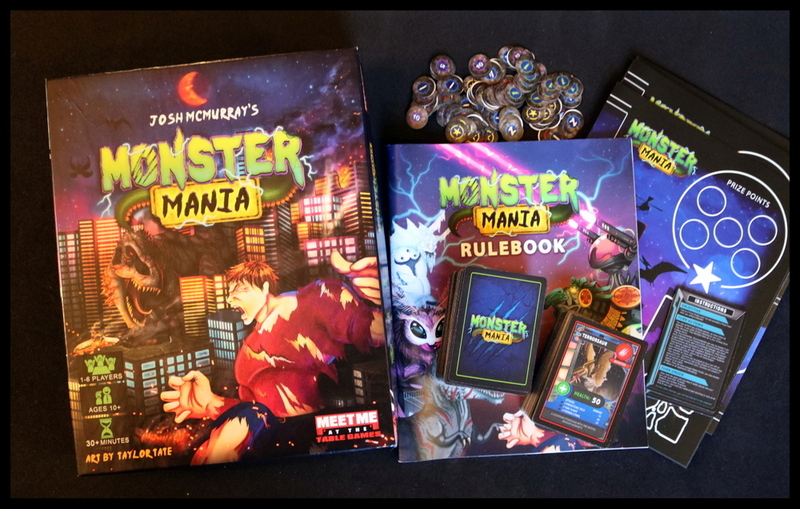 In its current form, Monster Mania was difficult for us to learn from the rule book. 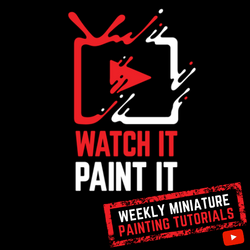 We found a few things we would prefer to change in the rule book--having the most pertinent information summarized on the first two pages, and having FAQs in a separate section or card glossary at the back, rather than added after each introductory section. The player aids have great information but would do better to be on larger cards so the text could be more readable. Another pass by a copyeditor might help too, though some of the slips are intentional, like "Good Samariton" for a particularly heavy monster. In addition, when playing this game with only 2 or 3 players, the 210-card deck seems unwieldy, and we often seemed to go through long stretches of drawing cards that weren't useful (or too many of the same thing), and sometimes that led to a feeling of the game slowing down or dragging on. Perhaps a chart could be added, suggesting how to pare down the deck for fewer players (add X number of each type of card, etc.). With a smaller deck for 2 or 3 players, the game would probably flow a little better at those player counts. 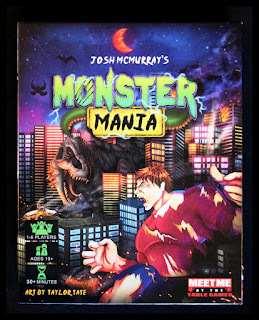 Fans of monster movies will enjoy battling with AzMech or Tree-Mendous, Slaying Mantis or Iron Menace, and players who like fighting games such as Magic the Gathering, Stratego Battle Cards, Thunder and Lightning, or even Munchkin may enjoy Monster Mania. 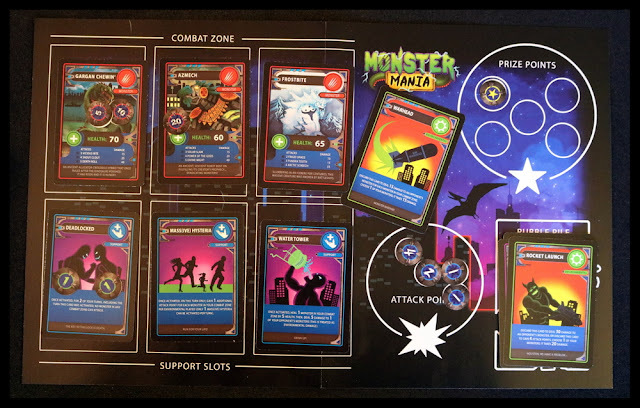 Monster Mania has creative Monsters and interesting action cards that can alter the powers and outcomes of the monster-on-monster battles. 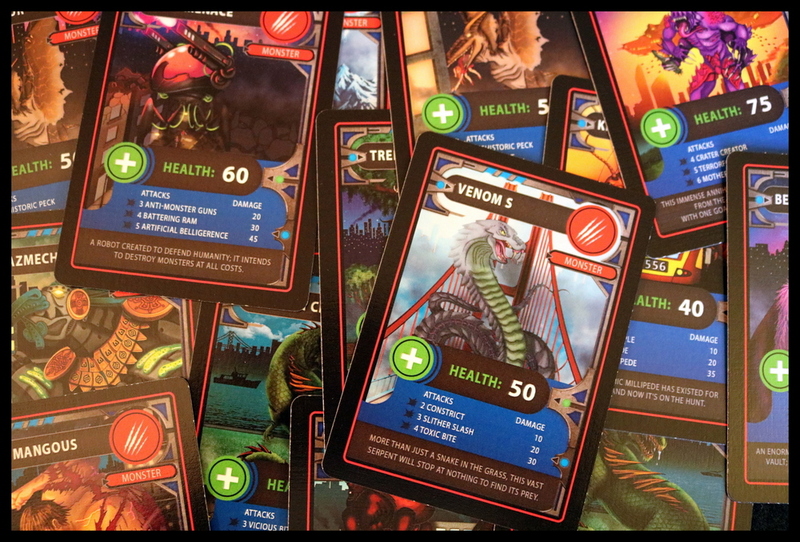 The art and storyline draw you in, though the rules and player aids in their current form show room for improvement. The intimidating 210-card deck has lots of fascinating ideas but could be trimmed down for play with fewer than 4 players. Overall, we enjoyed the entertaining new take on a battling card game, and we enjoyed this game as part of our October spooky-game-athon and we'll gladly pull it out for other themed game days. 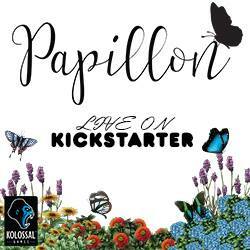 Coming to KICKSTARTER December 1, 2018.